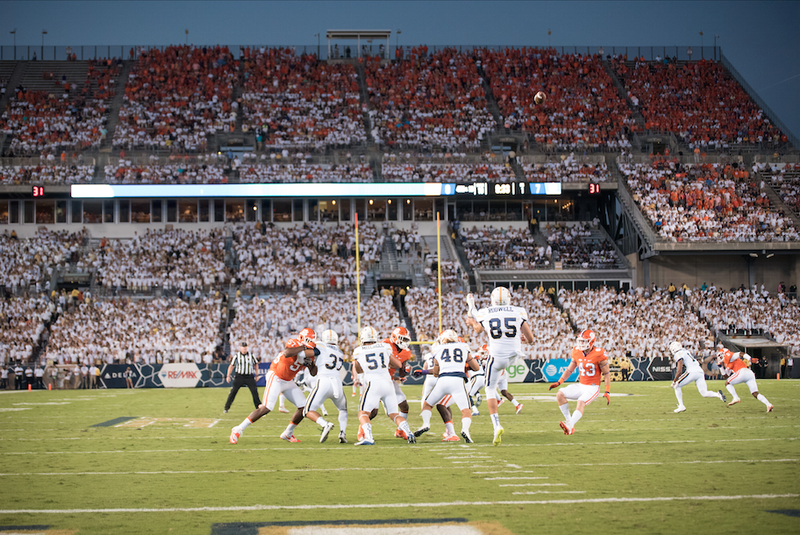 It was a very humid 88 degrees Thursday night as the Georgia Tech Yellow Jackets hosted the highly touted Clemson Tigers. Clemson wasted no time flexing their offensive muscles and not only scored on their first drive, but they did so in just three and a half minutes. Clemson QB Deshaun Watson hit WR Mike Williams with a 4 yard pass to get the games’ first touchdown. The same happened two minutes before the end of the opening quarter. Watson setup the touchdown by nailing a 25 yard strike to Trevion Thompson which put the Tigers at the one yard line. They left the one yard up to RB Wayne Gallman who scored on his first attempt. This was not the start the Yellow Jackets wanted. Georgia Tech QB Justin Thomas went 0-2 in passing and gained a mere three yards on four rushing attempts. Clemson had accrued 174 yards of offense while Georgia Tech had none (actually they had -1 yard to be exact). By the end of the first half, the Yellow Jackets had eight yards of offense. If it wasn’t for their defense stepping up, this game could’ve got out of hand early. I say that, but the score was 23-0 Clemson (but it could’ve been worse). Before the half ended, in a scene you couldn’t have scripted, one play took place that summed up Tech’s first half pretty well. Georgia Tech had an interception at their 2 yard line, a teammate bumped into him and made him fumble back into the end zone, another teammate recovers the ball thinking it was a touchback, and the referees call it a Safety. All of that happened in 11 seconds. 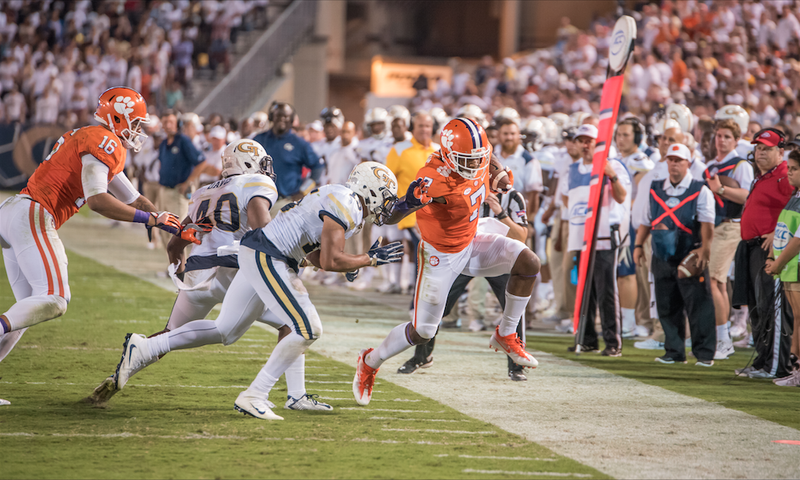 If they Clemson Tigers were a well-oiled machine in the first half (347 total offensive yards), they looked like they lost a cog or two in the second half. They were held to just a field goal in the second half and Georgia Tech’s defense was starting to look like something out of a highlight film. Although Georgia Tech eventually scored to make the game 26-7, the damage had been done in the first half and the ‘sting’ lingered the rest of the game. Justin Thomas was off his mark from the start and the offense just couldn’t get things going with missed passes and dropped balls. Their defense on the other hand kept them alive throughout the game. It wasn’t perfect since they allowed 26 points, but the score could’ve been much worse had the defense not stepped it up on key downs. Georgia Tech will face Miami at home Oct. 1 and Clemson will face Louisville at home the same day.